President Donald Trump and French President Emmanuel Macron in Paris. 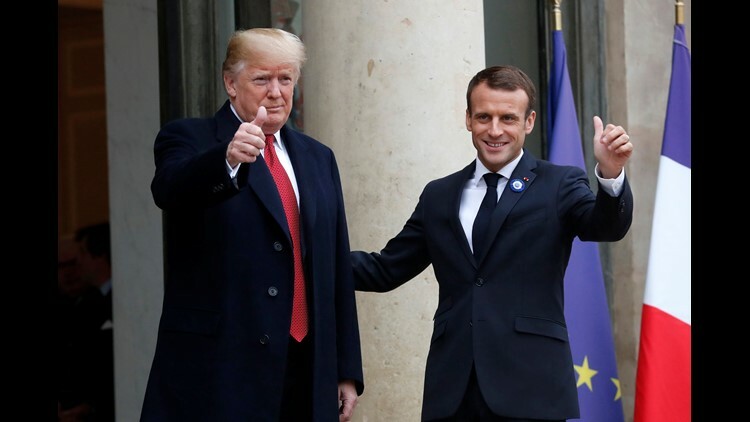 PARIS – After a low-key day in France, President Donald Trump on Saturday accused Democrats back home of seeking to "steal" Senate and gubernatorial races in Florida. "Trying to STEAL two big elections in Florida! We are watching closely!" Trump tweeted from the City of Light right before a special dinner with other world leaders. Republican candidates Rick Scott and Ron DeSantis declared victory in Florida governor and Senate races this week, but the close margins have triggered statewide recounts. The Democratic candidates Bill Nelson and Andrew Gillum, respectively, were able to close the gaps as the ballots were counted. Trump's previous attacks on the Florida recounts have prompted Democrats to accuse him of attempted theft by trying to shut down the process before all the votes are counted. Some also said that Trump fears the recounts will lead to Democratic victories. “This process is about one thing: making sure every legal ballot is counted and protecting the right of every Floridian to participate in our democracy," Nelson said in a statement. Had very productive meetings and calls for our Country today. Meeting tonight with World Leaders! Trump tweeted his claim before attending a dinner at the Musée D’Orsay for leaders who are in Paris for events to commemorate the 100th anniversary of the end of World War I. The president spent his afternoon out of public sight. He tweeted that he had "very productive meetings and calls for our Country today," but he did not specify what they were about. Trump had planned to visit an American cemetery from the World War I era, but canceled that event due to what a White House statement called "scheduling and logistical difficulties caused by the weather." Earlier in the day, Trump had a no-fireworks meeting with his host, French President Emmanuel Macron. The two had clashed Friday over Macron's call for a new European military force, but the two worked on what the French government described as "a misunderstanding." The two leaders also discussed trade, including tariff threats between the United States and European Union. "We’ll see if we can get it over the line, as they say," Trump said, though any new trade agreement would have to be with the European Union, not France as an individual country, because of EU trade rules. Trump has also tweeted on other domestic issues during his foreign trip. Earlier on Saturday, he issued a tweet blaming the California wildfires on "gross mismanagement" of forest lands, and threatened to withhold federal problems if it is not addressed.